Dymo has offered one of our lucky brides-to-be a label maker and tapes in order to stay on top of the planning process. 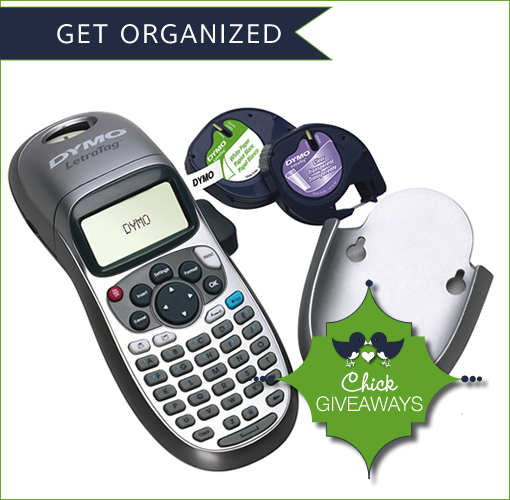 Simply leave a comment on how a Dymo Label maker would make your planning process a bit easier. The Clutter Queen over at Dymo also shared some tips in order to make the planning process run a bit smoother. Every bit helps! - Create a binder with sections labeled for calendar, dress ideas, guest list, registry, shopping lists, showers and parties, thank you cards, gift lists, bridal party schedules, and so on. Take the binder with you on appointments and meetings. Everything will be in one place for easy reference. - To help keep track of the landslide of wedding gifts you receive, use file folders and label them by category - gift cards and certificates, receipts, returns, etc. Also, consider labeling the outside of the box a gift comes in with who gave it to you. This will help when writing thank you notes later. - If you plan to provide a special CD for the DJ to use during the reception, clearly label the disc case with the song name and track number using a product like the DYMO™ Personal Labelmaker. For a more personalized disc, use the DYMO DiscPainter™ CD/DVD printer, which will print text and photos directly onto the disc. This way there aren't any slip-ups during your special dance.